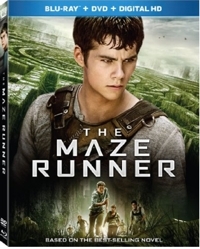 The Maze Runner is the latest young adult post-apocalyptic sci-fi novel series to make it to the big screen. Directed by relative newcomer Wes Ball (Beginners), the film follows the journey of 16-year-old Thomas (Dylan O’Brien), who awakens in an elevator shaft that dumps him in the middle of a grassy field, surrounded by a gigantic stone maze. He’s not the only one, because other teenage boys have been deposited here, and none of them have any memory of who they were before the Maze—they only remember their names. 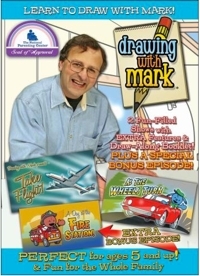 If you have a small child who loves to draw and wants to get better at representational art, the Drawing with Mark DVDs might be just the ticket. While there are scores of learn-to-draw books out there, let’s face it: this up-and-coming generation is motivated by electronic and interactive learning situations, and nothing can take the place of actually seeing an artist draw so you can imitate the strokes. Maybe that’s why this series has earned the Seal of Approval from The National Parenting Center. Mark Marderosian worked as an illustrator for Disney books and Golden Books during the ‘90s and in 2007 he created and marketed a collection of children’s stuffed animals called Angels from the Attic, with each character coming with a related storybook. 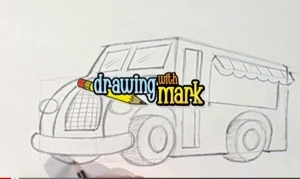 In 2010 he and designer-animator Robert Palmer Jr. developed a TV show called Drawing with Mark, which was provided free of charge to public-access cable TV stations. That first year more than 105 channels came onboard, and in 2013 the Boston/New England Chapter of the National Academy of Television Arts and Sciences nominated the show for a Regional Emmy Award in the Children’s/Youth category. It didn’t win, and I can see why. Though Mark’s heart is in the right place, the show combines “visits” to see the real thing plus drawing lessons, and the latter is definitely stronger than those field trips. Children are savvy and Mark comes across as not quite exuberant enough and the writing such that you wonder what ages are being targeted. Since his animated “angels” hover in many of the field-trip scenes, you have to think that he’s going for the seven-and-under crowd, but the drawing lessons themselves are such that the whole family can participate. Pictionary is popular, and I can see families with children too young to play that game starting off with this. Pop in a DVD and have everyone draw, then compare and see how people did. Since family members will draw at different speeds, you’ll want to be able to pause the DVD frequently to give everyone a chance to catch up. Drawing with Mark: Take Flight, As the Wheels Turn & Fire Station was released on December 2, and so was Let’s Go to the Zoo & Zoo Stories. At the risk of perpetuating gender stereotypes, it’s still been my experience that cars and planes and fire engines are of more interest to boys, but there’s an advantage to starting with this disc: there’s more angularity in vehicles, and they therefore seem easier to draw than the animals. And I will say this: My children can attest that I’m the worst drawer when it comes to a game like Pictionary, but I was able to draw the airplane and cars right along with Mark. The secret is in the steps, and while Mark won’t be there forever to follow, you have to believe that learning the logic of sequence in a number of examples will make enough of an impact so young would-be artists can begin to guess sequences on other objects as well. 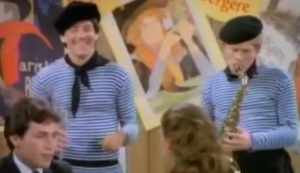 Some sitcoms are born fully formed, but that wasn’t the case with Happy Days. Though it debuted as a mid-season replacement in January 1974 and finished in the #16 spot that season, it took a second year before the series really hit its stride. By Season 4, Happy Days had become a pop phenomenon, in part because the ‘70s were a time of turmoil and this show transported everyone back to the happier, simpler 1950s. But a “greaser” named Arthur “Fonzie” Fonzarelli (Henry Winkler) quickly became the show’s most popular, and his catch phrase “Heyyyy!” caught on just as much as the show’s “Sit on it!” insult. 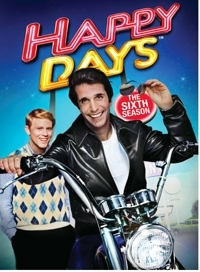 During its fourth season Happy Days became the #1 show in America, then dropped to #2 its fifth season and #3 its sixth. But truthfully, the numbers don’t tell the whole story. The early shows were driven by ‘50s nostalgia and ‘50s situations and phrases, like “You got it made in the shade.” Then the show’s success changed everything. Fans loved Fonzie, so, as it happened with Mister Ed and other TV sitcoms where a character took over, more episodes were written to showcase him. And when fans responded well to the crooning of Potsie Weber (Anson Williams), he got more songs—way too many, given the generic quality of his voice. Before you knew it, the plots bore little resemblance to the 1950s and were instead character-driven. That also meant the plots became more generic, because, no longer tied to the ‘50s, they could have happened to anyone. In Season 5 Fonzie “jumped the shark,” literally, on water skis. But figuratively the phrase has come to mean when a TV show starts to go downhill. You don’t have to look any farther in Season 6 than the first three episodes, in which the whole cast packs up and moves west to help Marion’s uncle save his dude ranch. It’s clear that the writers thought the characters were so popular that they could put just about anything down on paper and it would work. But with such character-driven plots, ‘50s nostalgia was the first casualty . . . and that’s what had made the show popular in the first place. This season, the characters—including Ralph Malph (Donnie Most), Mrs. C. (Marion Ross), Mr. C. (Tom Bosley), and Al from the drive-in (Al Delvecchio) seem like caricatures of themselves. A full 25 out of 27 Season 6 episodes are inferior, with the only exceptions being one in which Potsie drops out of school, and another in which Joanie (Erin Moran) falls for the high school quarterback but sees him with another girl and ends up facing her Sweet Sixteenth birthday party without a date—and even that episode is marred by Potsie’s singing. The other shows involve an incredible amount of silliness and hard-to-believe situations, whether its Fonzie becoming blind after being hit by a serving tray, the gang dressing up for Thanksgiving, or Richie falsely accused of being the Kissing Bandit. These “post-shark” episodes seem mostly contrived, and if families want to give Happy Days a chance, your best bet is to go with Seasons 2, 3 and 4. Those are truly family-friendly seasons that hold up, still. Entire family: No, but . . .
Who could have predicted that a Han Solo type, a talking raccoon, a walking tree, an ill-tempered green-skinned woman, and a shirtless tattooed convict would make such an entertaining group to watch? Almost as surprising—at least for the parents who thought they were turning their kids on to another Star Wars—is that Disney-Marvel’s Guardians of the Galaxy is about a group of intergalactic escaped convicts who band together despite great differences and decide to do something unselfish for a change. And it’s a doozy: they try to save the universe, starting with a planet that the villain intends to destroy. 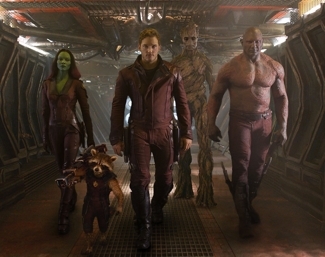 The main characters are different from the group that appeared in the 1969 Marvel comic book, but credit Disney for finding a way to assemble them from other Marvel comics and insert them into a cohesive, slam-bang sci-fi/fantasy adventure that takes the original Guardians concept and runs with it, while also generating a comic-book vibe built on non-stop action. And the best part? Humor rides along in a sidecar. The film’s gags and jokes will make all that sci-fi violence palatable for parents who worry about their children being exposed to such things. Guardians feels like a visual comic book, and tone is largely responsible. 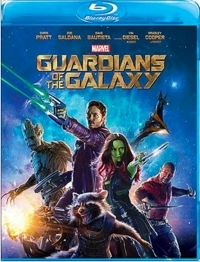 It’s fun, it’s funny, it features a strangely likable group of characters and terrific action sequences and special effects, and the screenplay and direction keep things moving along—another surprise, really, if you consider that the film is directed by James Gunn, the fellow who gave us the clunky live-action Scooby-Doo movie.